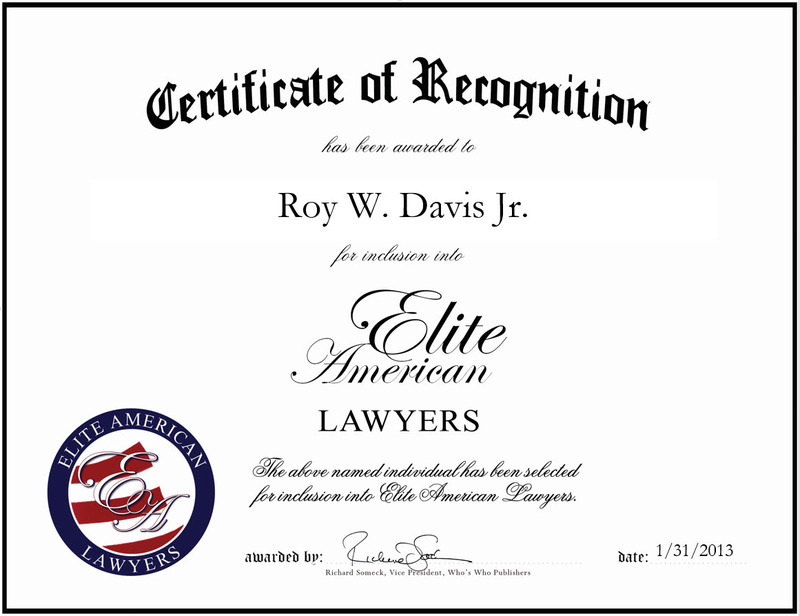 Roy W. Davis Jr. is an Attorney for Van Winkle Buck Wall Starnes & Davis PA, a premier law firm offering exemplary legal services throughout North Carolina and the Southeast. With heightened proficiencies in civil trial advocacy, and neutral mediation, Mr. Davis shines as a luminary in his field, bringing forth more than 52 years of professional experience to the practice. In his capacity, Mr. Davis handles practice areas of law, including litigation in state and federal courts, mediation, and general practice, mostly in the defense position. Mr. Davis has garnered a reputation of distinction for his exceptional efforts demonstrated over the course of a triumphant career, and he continues to strive for excellence in his every endeavor. He is a fellow of both the International Society of Barristers and the American College of Trial Lawyers, and a recipient of the Roy Davis Award, and the Centennial Award for the 28th Judicial District Bar. He was also inducted into the North Carolina Bar Association General Practice Hall of Fame, and The Order of the Coif. Mr. Davis has covered areas in personal injury, professional malpractice claims, business and employment matters, wills and estate litigation, commercial and environmental issues, and declaratory judgment actions. He has a son and daughter who are both attorneys. He is the Former President of the 28th Judicial District Bar, a past member of the House of Delegates with the American Bar Association, and a former member of the American Bar Foundation and the North Carolina Association of Defense Attorneys. He was past Vice President of the North Carolina Bar Association, the Past Chair of the Administration of Justice Committee, and the Past Chair of the Young Lawyers Division. He was the Past President of the North Carolina State Bar and Past Chair of the Ethics Committee. Mr. Davis is currently a member of the North Carolina Board of Law Examiners, an organization with which he has maintained affiliation since 2002. He attributes his success to hard work and patience. His father was an attorney and he has a son and daughter whom are both attorneys. This entry was posted in Legal Defense and tagged civil trial advocacy, estate litigation, general practice, malpractice claims, neutral mediation. Bookmark the permalink.